The ZeptoCHIP is an oligonucleotide microarray designed to detect and identify more than 97.5% of bacteria responsible of bacteraemic episodes. This microarray, profiting from the Planar Waveguide technology for increased signal/noise performances, was developed through a close collaboration between ZeptoSens AG (Witterswil - Switzerland) and our laboratory. 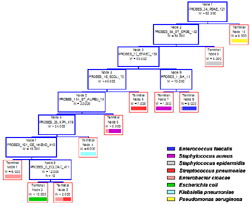 a customized artificial neural network and decision tree for microarray data analysis. bacterial identification using appropriate phenotypic tests. This strategy relies on bacterial growth and requires at least 24-48h. Earlier results could rationalize the usage of broad-spectrum antibiotics, thereby reducing drug-related selection pressure and costs. The goal of our study was to develop a rapid bacterial identification directly from blood culture samples (less than 6 hours). 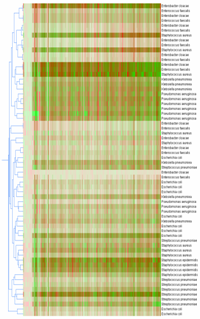 Analysis of positive blood cultures identified in our institution during the last decade Selection of a subset of species covering >95% of bacteriemic episodes. Define unique molecular signatures for these pathogens based on their 16s rRNA. Assess the discrimination of these signatures on microarrays. Develop a highly sensitive detection method to skip enzymatic amplification. Compare conventional analytical methods with artificial neural networks. Fig. 1 : 16s rDNA sequence database. 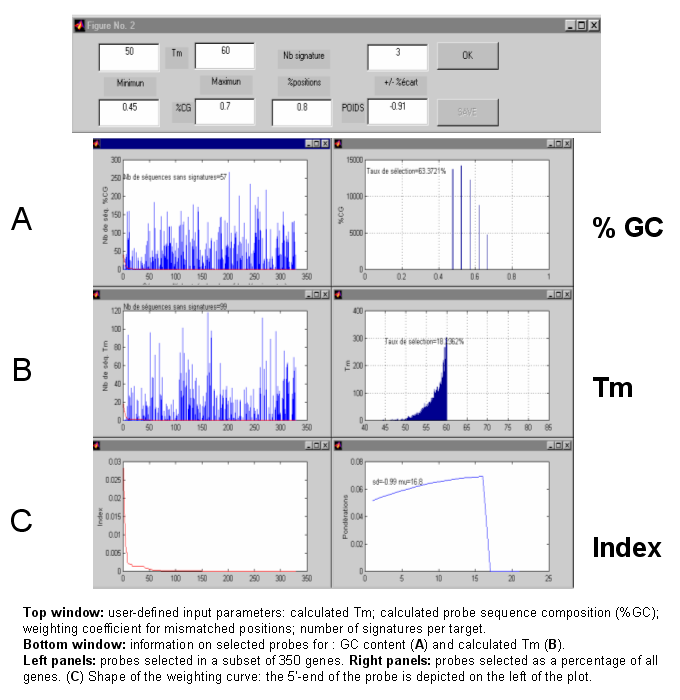 Top window: user-defined input parameters: calculated Tm; calculated probe sequence composition (%GC); weighting coefficient for mismatched positions; number of signatures per target. 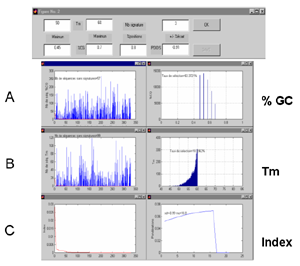 Bottom window: information on selected probes for : GC content (A) and calculated Tm (B). 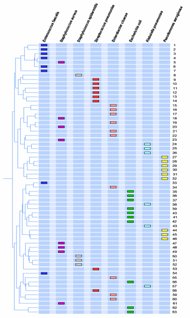 Left panels: probes selected in a subset of 350 genes. Right panels: probes selected as a percentage of all genes. (C) Shape of the weighting curve: the 5’-end of the probe is depicted on the left of the plot. Fig. 2 : Selection of discrimant signatures. 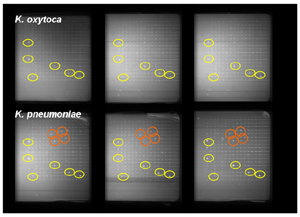 Images obtained from the scanning of six separate ZeptoCHIP experiments, either using Klebsiella oxytoca (top row) or Klebsiella pneumoniae (bottom row) as a starting material. The ZeptoCHIP arrays contained 272 spotted features. 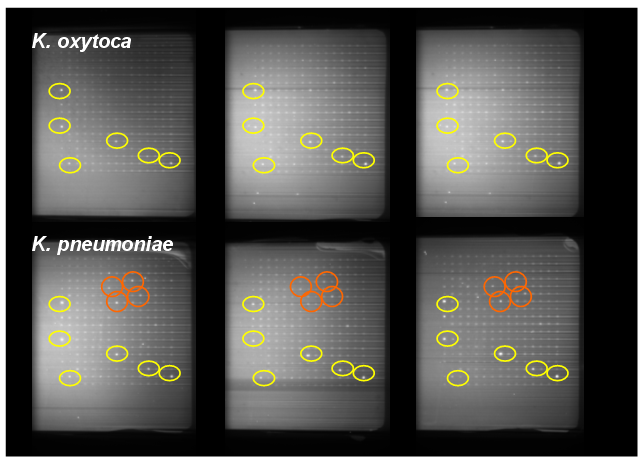 Six probes provided reproducible signals in both Klebsiella spp (yellow circles) while four other probes (orange circles) provided additional information that allowed distinguishing both species. One-way clustering of 63 experiments, using 8 bacterial classes as different sources of total RNA. Features were background subtracted, and clustered using a Pearson correlation in GeneSpring (Silicon Genetics). 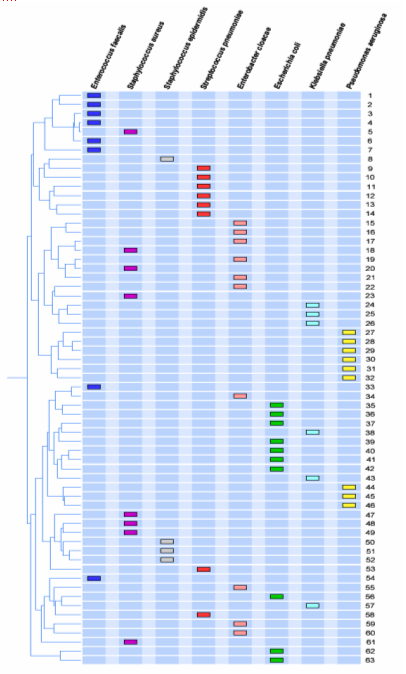 Color-coded vertical bars correspond to the signals generated by each of the 272 probes. [Click image to enlarge] Synthetic display of the same experiments, but here the clustering was performed after data normalization. Each class is depicted by a separate color. 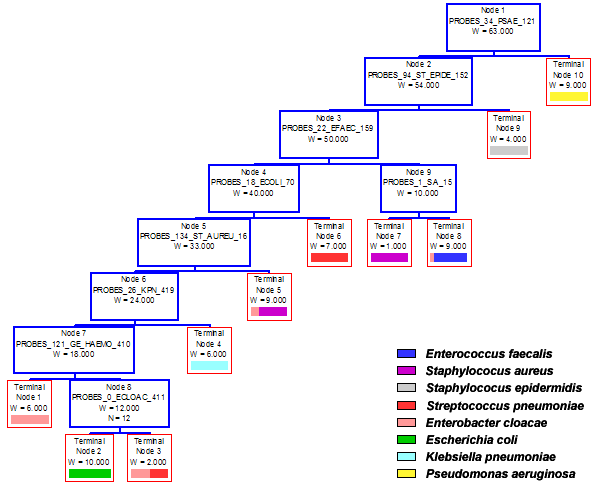 Decision tree generated by CART, using the same data as in the clustering analysis (same color code). Each node corresponds to a branching point that categorizes experiments. Branching stopped when the classification improvement reached an optimal cost. Estimated probabilities for the experiments to be misclassified by an artificial neural network, after 600 learning cycles. 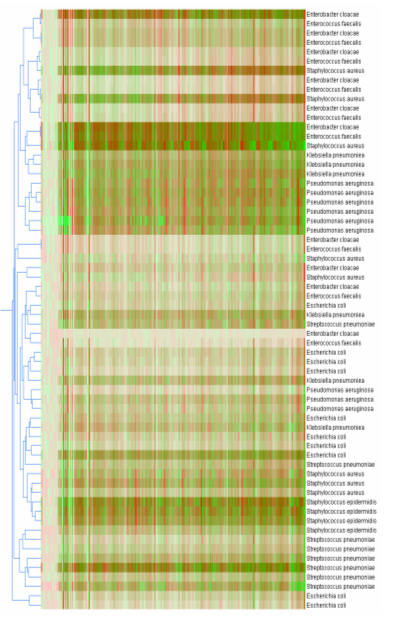 For each bacterial species, percentages were determined using either a complete set of 272 probes (top bars), or a reduced set of 81 probes designed to detect only these 8 bacterial classes (bottom bars). Select signatures with homogeneous thermodynamic properties. Robust chemical labeling and short hybridizations (<1h). The ZeptoCHIP, an oligoarray with 272 probes designed to detect >95% of clinical pathogens, provided poor discrimination when using threshold-based analysis (clustering, decision trees) Artificial neural network analysis proved far more reliable for bacterial identification and discrimination. In collaboration with EPFL partners (Horst Vogel, Theo Lasser) and ZeptoSens AG, evanescent waveguide technology coupled to innovative signal amplification is under development to detect a few copies of hybridized target. Francois P, Charbonnier Y, Jacquet J, Utinger D, Bento M, Lew D, Kresbach GM, Ehrat M, Schlegel W, Schrenzel J.